Sorry... the 2017 Nissan Murano is no longer being sold as new. Instead, take the first step to a great deal on 2019 Nissan Murano with a free price quote! 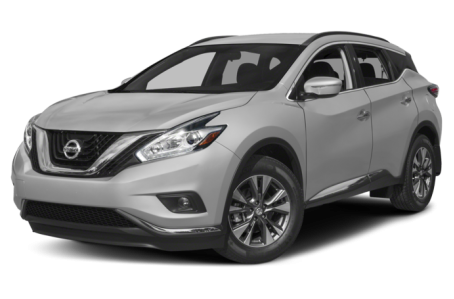 The 2017 Nissan Murano is a mid-size SUV that seats 5 passengers across 2 rows. It competes with the Honda Pilot, Toyota Highlander, and Mazda CX-9. This year, it remains largely unchanged. The Murano has a bold, aerodynamic appearance that is atypical compared to other SUVs in its class. It features jagged, “boomerang” headlights and taillights as well as a prominent V-shaped front grille. The blacked-out D-pillars makes the roofline appear like its floating. Standard features include automatic headlights, LED daytime running lights, chrome door handles, and power side mirrors with turn-signal indicators. LED headlights, front fog lights, silver roof rails, a power panoramic moonroof, and a power liftgate are available as well. Under the hood, the Murano’s power comes from a 260-hp, 3.5-liter V-6 which is mated to a two-speed continuously variable automatic transmission (CVT). Front-wheel drive comes standard, while all-wheel drive is optional. Fuel economy for the Murano is an EPA-estimated 21/28 mpg city/highway. Inside, the Murano has a premium cloth seating with a 60/40 split-folding rear seat. Cargo capacity is 67 cubic feet with the rear seat folded down. The V-shaped center console is sporty and features a standard multimedia system that includes a 7-inch display, Siri Eyes Free Mode with voice recognition, a Nissan mobile app suite, Bluetooth connectivity for phone and audio, and a USB port. It can be upgraded with a larger 8-inch touchscreen, an integrated navigation system, and a Bose premium audio system. Standard features include dual-zone automatic climate control, remote keyless entry, push-button start, and power windows/locks. Leather upholstery is also available. Standard features include a backup camera and a tire pressure monitoring system. Nissan’s Around View monitor system is optional, which displays a top down view of the Murano that helps with parking. Additional active safety features are also optional, including a blind spot warning system, rear cross-traffic alert, forward collision warning, forward emergency braking, and adaptive cruise control. 68 of 68 (100%) consumers said they would recommend this vehicle to a friend.